The state of global polar sea ice area at the beginning of December 2010 remains well below climatological conditions (1979-2008). Sea ice in the Arctic continues to track far below average while Antarctic sea ice stayed slightly above average. 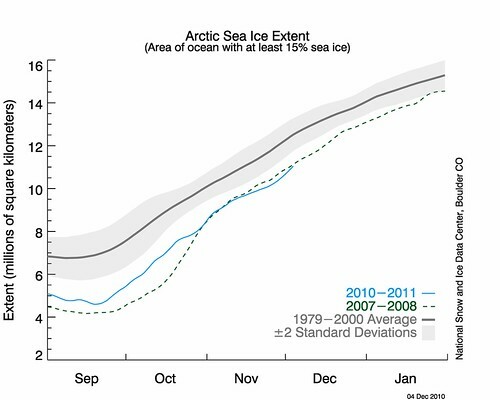 Overall, the rate at which Arctic sea ice is refreezing and Antarctic ice is melting is not out of the ordinary. The locations where freezing and melting is occurring is news this month. 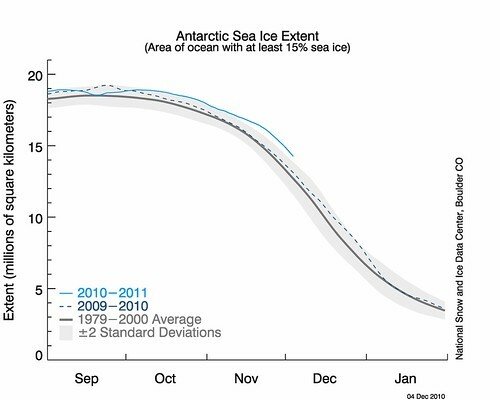 Global sea ice is rapidly decreasing, as is normal for this time of year due to Antarctic environmental conditions. 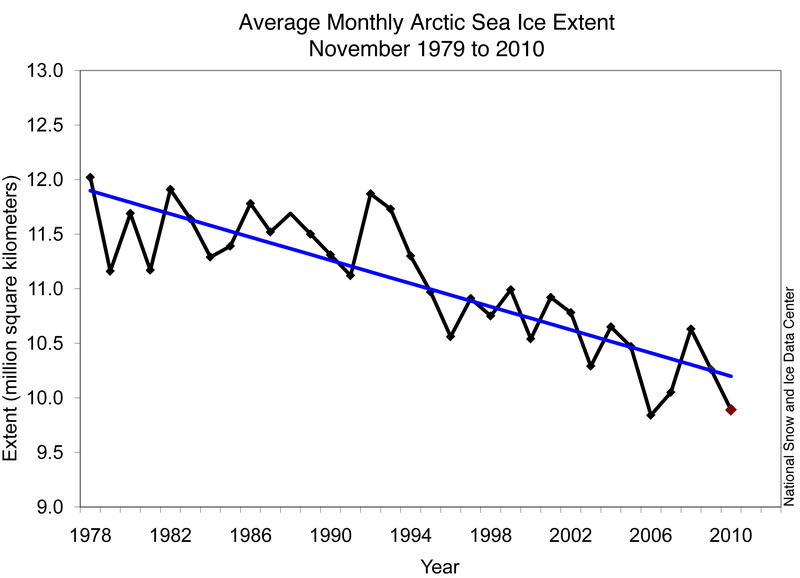 The rate of freezing of Arctic sea ice slowed in November from October. Ice growth was actually slower than the climatological normal rate. It was so slow that Arctic sea ice extent averaged over November 2010 was the second-lowest November ice extent recorded – a mere 50,000 square kilometers above the previous record low of 9.84 million square kilometers set in 2006. The presence of relatively warm pockets of water in the region, combined with local weather patterns, helped keep the extent this low. A time series graph of ice extent anomalies maintained by the University of Illinois at Urbana-Champaign’s Polar Research Group shows that ice extent moved past the -1 million sq. km. anomaly line for a short time during November. It is currently hovering near -1.1 million sq. km. 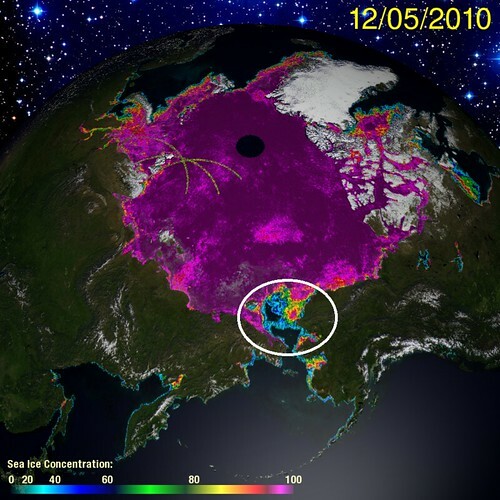 The duration of this low anomaly has only been recorded once before, in the record low 2007 year. While still negative, the anomalies in 2008 and 2009 were not as severe as this year’s. The change in November ice extent has been measured at -4.7% per decade by the NSIDC. It should be noted that for the first 16 years of that record, the extent didn’t have a significant positive or negative trend. It is only since the early 1990s that a noticeable trend has developed. 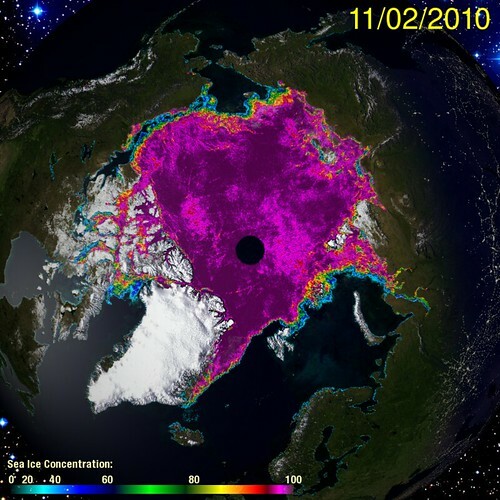 More important to polar climate processes than areal extent, however, is the volume of ice. Arctic ice volume has been decreasing for decades, but has worsened considerably in the past 5 years. After reaching a record low earlier this year, volume has recently risen back above -9000 cubic kilometers. Older ice tends to be thicker ice. Unfortunately, the age of ice in the Arctic has shifted significantly in recent years. Back in the 1980s and early 1990s, between 50% and 60% of the September Arctic ice was older than 2 years. That situation shifted in the 1990s and early 2000s when >2 year-old ice decreased to ~40% of all ice in the Arctic. 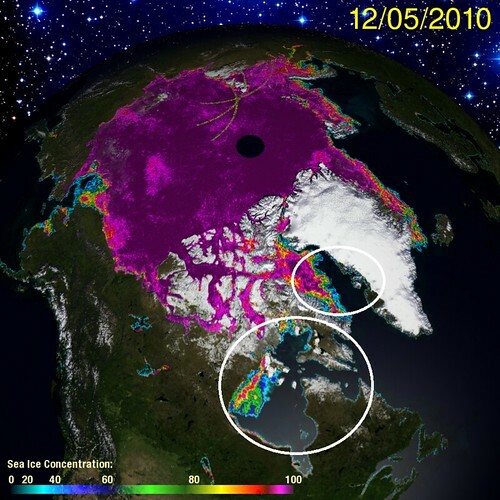 2008 was a devastating year for old Arctic ice, declining to 30% of all Arctic ice. Reflecting the new regime, old ice in 2009 declined to 20% of all ages and declined even further in 2010 to 10%. The white ovals highlight areas where sea ice is only beginning to form in early December, weeks after the time when this normally happens. Near-surface air temperatures near Siberia and Alaska were 5-9F warmer than normal in November. Most of the sea ice in the Bering Sea formed only within the past 7 days. Instead of half of Hudson Bay being covered by sea ice at the end of November, only 17% was covered by November 30th, 2010. Most of that 17% appeared in the last few days of the month. Normally, sea ice is found much further south along the west coast of Greenland. Even while a strong La Nina persists in the equatorial Pacific, sea surface temperatures in the North Atlantic are much higher than average. Remember, only 2006 saw a lower extent through November. The areas highlighted by white ovals in the December picture show something rather odd: ice-free ocean close to a continental land mass surrounded by solid sea ice. You can actually pick out the birth of these regions in the November picture. The cause of these ice-free areas is above-average near-surface air temperatures, which have been present near these regions throughout most of 2010. 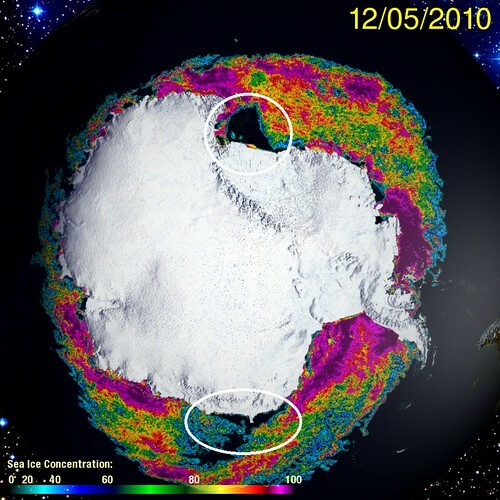 Antarctic sea ice in late 2010 is only slightly above the climatological norm. It is also higher than recent years’ extent for the same calendar date. The only useful conclusion to draw from those observations is the Antarctic still isnt’ responding to global warming forcing in the same way the Arctic is. Some of this has to do with the relative magnitude of warming over both poles, which isn’t the same. 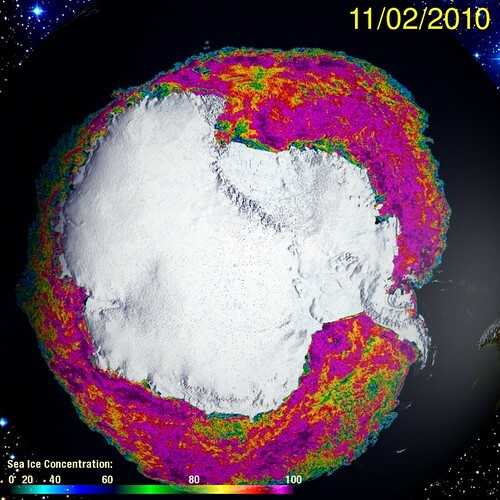 Another factor to consider is the presence of the ozone hole over Antarctica, which has allowed stratospheric temperatures over Antarctica to warm relative to climatological norms. This has had the effect of increasing the strength of the circumpolar vortex, which has kept cold air nearer to the South Pole and maintained the integrity of land and ice sheets. Here are my State of the Poles posts from November and October. You can find the NSIDC’s December report here. The page is dynamic, so if you’re reading this after December 2010, that month’s report will show up first. If that’s the case, you can look for any report in their archive on the top pull-down tab on the right-hand side of the page. Categories: environment, global warming, science | Tags: Antarctic sea ice, Antarctic sea ice extent, arctic ice, Arctic sea ice extent, climate change, climate change effects, global sea ice, global warming, ice thickness, NSIDC | Permalink.